2019 PDF Calendars with South Africa and Popular Holidays. Calendars are otherwise blank and designed for easy printing. They are ideal for use as a calendar planner. 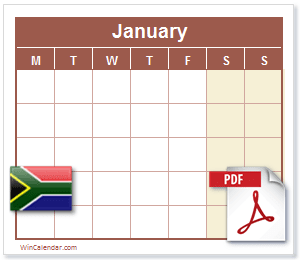 South Africa calendars are also available as editable Excel spreadsheet calendar and Word document Calendars. 2019 Calendar with South Africa Holidays. For calendar with holidays for the next year see:2020 Calendar with South Africa Holidays in Acrobat PDF format, 2021 Calendar with South Africa Holidays in Acrobat PDF format.